One of the causes contributing to the success of the Boy Scouts of America has been the thoughtful, wholehearted way in which each President of the United States since William Howard Taft in 1910 has taken an active part in the work of the movement. Each served as Honorary President during his term in office. President Bush, a former Cub Scout, praised Scouting and its enduring values when he appeared by video to the 40,000 Scouts, volunteers, and leaders at the 15th National Scout Jamboree at Fort A.P. Hill, Va., in July 2001. "Times and challenges change, yet the values of Scouting will never change. Scouts of any era would recognize every word that you live by today, because those words have always defined Scouting. The goodness of a person and of the society he or she lives in often comes down to very simple things, and the words found in the Scout Law. Every society depends on trust and loyalty, on courtesy and kindness, on bravery and reverence. These are the values of Scouting, and these are the values of America." 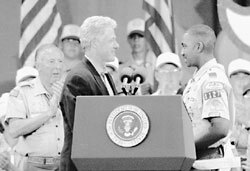 President Clinton greeted 30,000 Scouts and leaders and 6,000 staff at the 1997 National Scout Jamboree at Fort A.P. Hill, Va. He challenged Scouts and Scouters to spread the word of the importance of service to other Scouts and Scouters back home. "For almost a century, the Boy Scouts of America have helped to make volunteer service an American ideal. With every act of kindness, you've strengthened our nation's commitment to community and promoted a sense of civic responsibility." 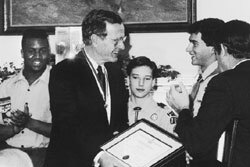 President Bush voiced strong support for Scouting and lauded the BSA for its fight against drug abuse. He appeared at the 12th National Jamboree at Fort A.P. Hill, Va., on August 7, 1989. "The Boy Scouts of America has assumed a leadership role in confronting this problem [drug abuse]. You are teaching self-protection strategies against drugs and other dangers. You have circulated these strategies in direct language in a very successful pamphlet called Drugs: A Deadly Game. And you have done something elseyou are leading the youth of America by example." 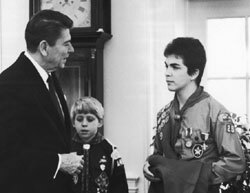 President Reagan became involved in Scouting with the Golden Empire Council in Sacramento, Calif., while serving as governor of the state. During his 8 years in office, he chaired Project SOAR (Save Our American Resources), served as membership roundup chairman, participated in annual Report to the Governor ceremonies, and served on the council's advisory board. For his service to youth, he was awarded the Silver Beaver Award. As a member of the Los Angeles Area Council, he served as Scoutorama chairman, as a speaker for the council recognition dinner, and as a sustaining member. "I applaud your many efforts and programs encouraging character development and leadership among American youth. By sponsoring many useful physical, mental, and social activities designed to promote self-responsibility, the Scouts strengthen the cornerstone of individual freedom in our nation. These programs develop the youngster's confidence in his ability to deal with nature, society, and a challenging world." 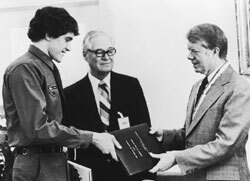 President Carter was involved in Scouting as a troop committee chairman and Scoutmaster. In support of the President's appeal for an energy conservation program, the Boy Scouts of America held a Scouting Environment Day, April 23, 1977, with other programs planned to make a major contribution toward achieving national energy conservation goals. "As a former volunteer Scout leader ... I am greatly impressed by the role of your fine program in our national life. It is a constructive initiative on the part of young Americans to explore career interests and to become better prepared for a more satisfying and rewarding future." 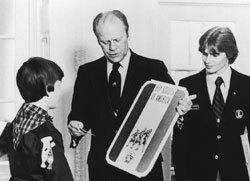 Gerald Ford was the first Eagle Scout to become Vice President and later President. He began his Scouting career on December 17, 1924, when he became a member of Troop 15, sponsored by the Trinity M.E. Church in Grand Rapids, Mich. He was recognized with the Distinguished Eagle Scout Award "for his service to the Nation and community," by the Grand Valley Council at Grand Rapids, Mich., in May 1970. He received the Scouter of the Year Award on December 2, 1974, from the National Capitol Area Council, Washington, D.C.
"One of the proudest moments of my life came in the Court of Honor when I was awarded the Eagle Scout badge. I still have that badge. It is a treasured possession. I am the first Eagle Scout Vice President. The three great principles which Scouting providesself-discipline, teamwork, and moral and patriotic valuesare the basic building blocks of leadership. I applaud the Scouting program for continuing to emphasize them. I am confident that your ability to bring ideals, values, and leadership training to millions of our young people will help to bring about a new eraa time in which not only our Republic will progress in peace and freedom, but a time in which the entire world shall be secure, and all its people free." President Nixon hosted the First National Explorer Presidents' Congress in 1971 on the White House lawn. 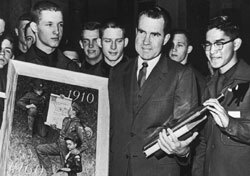 As Vice President he visited and spoke at the national jamborees held at Irvine Ranch, Calif., in 1953, and at Valley Forge State Park, Pa., in 1957. "I welcome your determination to seek out new members in our great and growing cities, as well as throughout rural America. For through Scouting many of these young citizens can more fully develop their potential for public service and become effective leaders in their communities and in our nation. "I strongly believe that Scouting offers an exceptional opportunity to learn about good citizenship by being a good citizen, and I am glad to hear that we can count on you to carry on the very important work ... in encouraging America's boys to make themselves into the men our country needs." 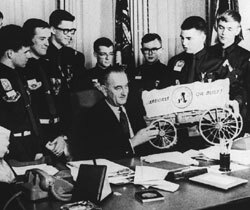 President Johnson was an active Scout leader with the Capitol Area Council at Austin, Texas, serving on its Exploring committee. He was a member of the National Capitol Area Council from 1959 through 1963. In 1963 he helped to organize Post 1200 in Washington, D.C., which was chartered to the House of Representatives for page boys working in the U.S. Congress. "I welcome this opportunity to express my pride and deep sense of gratitude for the outstanding example and enviable reputation for human understanding and fair play which have throughout the productive life of your organization been hallmarks of Scouting everywhere. Your conduct, both individually and in your group activities, has been worthy of admiration by all the young citizens of our land. Today, as we face the challenges of an increasingly complex and frequently disturbing world, America needs an alert, responsible, and energetic youth to provide her with a vital resource in a hopefully happier and fuller future for all. As I applaud your past, I also urge you to rededicate yourselves to the ideals of the Scout Oath, and to reaffirm your obligations to your God and to your country. In so doing, you will contribute to the strengthening of America's heritage and thereby to the realization of our common goals in the Great Society." 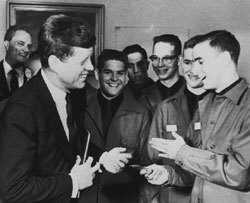 The first Scout to become President was John F. Kennedy, who was a member of Troop 2, Bronxville, N.Y., from 1929 to 1931 and a leader of the Boston Council. "For more than 50 years Scouting has played an important part in the lives of the Boy Scouts of this nation. It has helped to mold character, to form friendships, to provide a worthwhile outlet for the natural energies of growing boys, and to train these boys to become good citizens of the future. "In a very real sense, the principles learned and practiced as Boy Scouts add to the strength of America and her ideals." 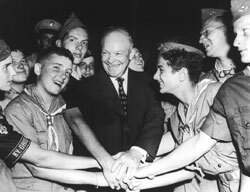 President Eisenhower became a member of the national Executive Board of the Boy Scouts of America in 1948. He had been a staunch supporter of Scouting ever since his son was a Scout. "The Boy Scout movement merits the unstinted support of every American who wants to make his country and his world a better place in which to live. Its emphasis on community service and tolerance and world friendship promotes a speedier attainment of the enduring peace among men for which we all strive. By developing among its members both a spirit of sturdiness, self-reliance, and a realization of the need for cooperative effort in every major enterprise, the movement is a prime force in preparing tomorrow's men for their duty to themselves, their country, and their world. Here in the United States the Boy Scouts of America have accomplished much in its years of service. But today, more than ever before, we need expansion of its membership and influence." 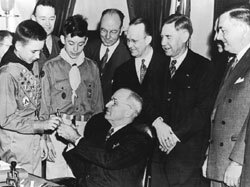 President Truman gave strong support to the Boy Scouts of America at every opportunity. He traveled to Valley Forge, Pa., in June 1950 to open personally the Second National Jamboree. "The Boy Scouts of America, since it was founded in 1910, has contributed greatly to the character training of our youth. What a greater nation this would be if the principles of Scouting could be woven more closely into our daily lives. If we can impress upon our youth principles of friendliness and mutual respect, we shall go a long way toward establishing a better understanding among the nations of the world. The Boy Scouts of America is making a vital contribution to the character building of our boys and young men. Let us work together to make the program of the Boy Scouts available to every American boy." President Roosevelt was the first to enter the White House with a record as an active Scout leader. He was president of the Greater New York Councils of the Boy Scouts of America. In 1934 hundreds of thousands of Scouts assembled to hear President Roosevelt's broadcast appealing for help for the needy. In response, Scouts contributed by collecting nearly 2 million articles of clothing, household furnishings, and other articles for needy families. 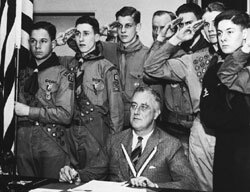 When FDR died in 1945, he had a record of 24 years' service in Scouting. "As one who has been interested in Scouting over many years it has been most heartening to have so many evidences of the practical values of Scout training. We must remember that next to active military service itself, there is no higher opportunity for serving our country than helping youth to carry on in their efforts to make themselves physically strong, mentally awake, and morally straight, and prepared to help their country to the full in time of war, as well as in time of peace. We must make sure that those volunteer agencies which are supplementing the church, the home, and the school by providing programs that will help equip the present generation to cope with life problems in the difficult days ahead are maintained to their maximum capacity and effectiveness." 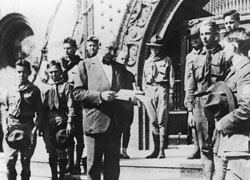 President Hoover launched a forward movement and development program for the Boy Scouts of America at a dinner commemorating Scouting's 20th anniversary. "The first test of democracy is that each individual shall have the opportunity to take that position of leadership in the community to which his character, his ability, and his ambition entitle him; and because the progress of our country is thus directly related to the training in leadership we can give the youth of the Nation. In meeting the vital need that when the oncoming generation takes over our national affairs it shall be a generation bulwarked with character, the Boy Scout movement plays a most useful part. "The Boy Scout movement has opened for him the portals to adventure and constructive joy, by reviving the lore of the frontier and the campfire; by establishing contacts with the birds and sometimes with the bees; by matching his patience to the deliberate character of fish; by efficient operations of the swimming hole; and by peeps into the thousand mysteries of the streams, the trees, and the stars." 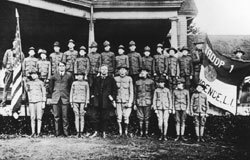 President Coolidge's two sons were Scouts, and he had many opportunities to see the Scout program at work. He participated in the 16th Annual Meeting of the National Council in Washington, D.C., in 1926 by presenting the first Silver Buffalo Awards for distinguished service to boyhood. "The more I have studied this movement, its inception, purposes, organization, and principles, the more I have been impressed. Not only is it based on the fundamental rules of right thinking and acting, but it seems to embrace in its code almost every virtue needed in the personal and social life of mankind. It is a wonderful instrument for good. If every boy in the United States could be placed under the wholesome influences of the Scout program and should live up to the Scout Oath and rules, we would hear fewer pessimistic words as to the future of our nation." 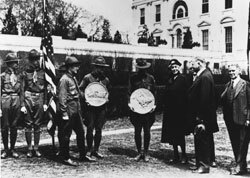 "Harding Awards" authorized by President Harding went to 5,058 Scout troops in 1923 for having increases in membership. "I am with the Scout movement heart and soul. It is an organization teaching the spirit of service and honor which we must always have in our citizenship. It is a school of democracy because in it, standing is won only by taking the equal opportunity given all individuals to show their own merit, capacity, and worth. I wish every boy in our America could have the advantage and the honor of being in the Boy Scout organization." 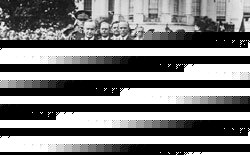 President Wilson signed a bill on June 15, 1916, which was passed by both Houses of Congress by unanimous consent, granting the organization federal incorporation. "The Boy Scouts have not only demonstrated their worth to the Nation, but have also materially contributed to a deeper appreciation by the American people of the higher conception of patriotism and good citizenship. Every nation depends for its future upon the proper training and development of its youth. The American boy must have the best training and discipline our great democracy can provide if America is to maintain her ideals, her standards, and her influence in the world. Anything that is done to increase the effectiveness of the Boy Scouts of America will be a genuine contribution to the welfare of the Nation." 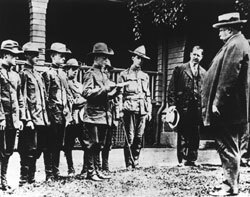 When President Taft in 1910 agreed to be Honorary President of the Boy Scouts of America, he set a precedent accepted by each of his successors. President Taft accepted to "thus sustain a similar relation to the movement as does King George V to a similar movement in England." The First Annual Meeting of the organization was held in the White House at the invitation of President Taft. "I am very glad to give my sympathy and support to such a movement as this. Anything that directs the boy's spirit in the right channel for usefulness and for the making of manly men should be encouraged." Theodore Roosevelt was no longer President of the United States when the Boy Scouts of America was started in 1910. But he was an ardent booster of the organization. He was a troop committeeman of Troop 39, Oyster Bay, N.Y., and first council commissioner of Nassau County Council. As a former President he was elected an Honorary Vice-President of the Boy Scouts of America. He was the first and only man designated as the "Chief Scout Citizen." For many years after his death in 1919, several thousand Scouts and leaders in the New York area made annual pilgrimages to his grave in Oyster Bay. "More and more I have grown to believe in the Boy Scout movement. I regard it as one of the movements most full of promise for the future here in America. The Boy Scout movement is distinctly an asset to our country for the development of efficiency, virility, and good citizenship. It is essential that its leaders be men of strong, wholesome character; of unmistakable devotion to our country, its customs and ideals, as well as in soul and by law citizens thereof, whose wholehearted loyalty is given to this nation, and to this nation alone." Clause 1. The President of the United States may, during term of office, be elected to be the Honorary President of the Boy Scouts of America. In addition, living former Presidents of the United States and other citizens who have rendered distinguished service to our country through work for young people may be elected to be honorary vice-presidents. Such election shall be by the Executive Board upon the recommendation of the Nominating Committee for such terms as the Executive Board shall specify.